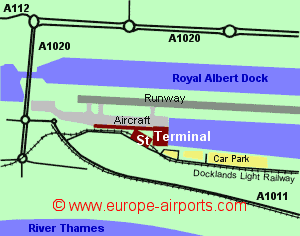 London City Airport has a single runway lying between 2 of the old docks, licenced for use by particular aircraft and crew capable of approaching with a glide slope of 5.5 degrees and landing on the relatively short runway (normal airport approaches are at 3 degrees). The airport is located very close to the city's financial centre and boasts the shortest check-in times of any of the London airports. The Dockland Light Railway (DLR) now has a station 50m from the terminal building, linking it with the city financial district and Canary Wharf. The nearest tube station is Canning Town, which also connects with DLR, having a 10minute journey time to the airport. Car parking is available at the airport, both short stay and long stay, the latter being with 500m of the terminal building. Car parking prices are higher than other airports, due to the location, with Long Stay being priced at approximately 10 - 45 pounds per day. 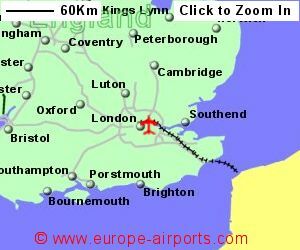 London City airport has 10 bars/cafes/restaurants, 5 shops, 9 ATM's, and 3 currency exchange facilities. There are numerous laptop plugin points and FREE WiFi Internet access (pre-register online to save time at the airport). 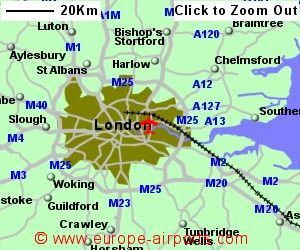 London City airport has Airport Carbon Accreditation, at the Optimisation level. The airport principally serves the financial districts of London but handled 4.5 million passengers in 2017, virtually the same as the previous year.